German hotels come in every price bracket, size and style. The wide range includes luxury hotels (like the pictured Frankfurter Hof), functional conference hotels for business travellers, cosy guesthouses & family-operated hotels. The latter are often located in beautiful historic houses. You see, the choice is all yours when you are looking for accommodation in Germany. Motel-style accommodation is not as common as in North America, Australia and other countries around the world. However, you'll find motels in locations close to the German Autobahn system as well. 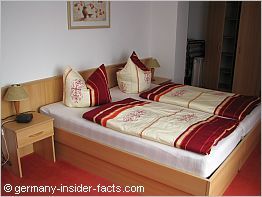 Families or a group of friends can rent an appartment (Ferienwohnung) to save costs when they stay more than one night. Whether you plan a business trip or your once-in-a-lifetime holidays, Germany has the right accommodation for your needs. Let me give you relevant information and help to find the best deals. On this page you'll find a general overview of accommodation types available in Germany, including some facts travellers from abroad complain about sometimes. Additionally, I have added some German phrases and words which might be helpful when you are travelling around Germany, looking for a place to stay. Print the list, and the little dictionary accompanies you on your travels. Want to search for a hotel in a certain city right now? Here is a list of German cities and towns from HotelsCombined. Select your city and compare the offers from major hotel booking agencies to find the best rates. 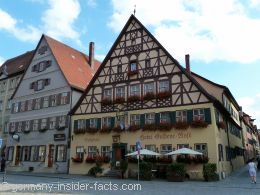 Apart from the large hotels you'll find thousands of smaller hotels in German cities and towns. Some are part of a hotel corporation, while others are still privately owned. According to the German Tourism Association, a hotel should have at least 20 rooms and a restaurant. There's one exception, the Hotel Garni. The word "Garni" is French and means with breakfast. Hotels in this category are usually smaller than the big names. They don't have their own restaurants, but they offer breakfast for guests. Like the Hotel Goldene Rose in Dinkelsbühl, many hotels are in wonderful historic buildings and offer lots of history, charm and Gemütlichkeit. Some old hotels are renovated to modern standards while others might lack a wee bit of the latest innovations, internet access, or a lift, for example. So if carrying your luggage and walking up to the 3rd, 4th or 5th floor is not to your liking, check if the hotel has a lift, or ask for a room on the first floor. I just love to stay in the historic hotels which are usually right in the centre of the old towns. You certainly know them all, the famous, big international hotel chains: Hilton, Sheraton, Marriott, Holiday Inn, to name a few. These hotels cater for business people and travellers who seek some luxury. They are located in city centres, near airports and fair grounds and offer conference rooms and all modern amenities. Very often, the look of these large hotels is nothing special, just a highrise like in any city around the world. However, inside you'll find the luxury and style to make your stay convenient. The above pictured Steigenberger Frankfurter Hof is different, it is located in a beautiful old building. The hotel is located in the city centre of Frankfurt and worth a visit, even if it is just for a drink. 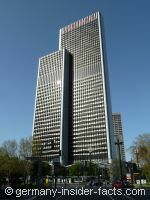 Steigenberger Hotels, a German hotel corporation, were family-owned until 2009. Don't think these business and luxury hotels in Germany are too expensive for travellers. Especially on weekends and during times without business events in a city, you can get a good deal. Just check them out if you ever dreamt to stay in a famous hotel. Germany is well known for its spa towns and health resorts (Kurort, Badeort). Cities and towns which include the word "Bad" or "baden" in their names, have mineral springs, or offer other hydrotherapeutic healing methods. Other cities and towns qualify for being a Kurort or Luftkurort because of their climate and fresh air. 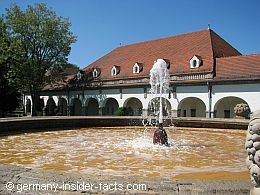 Famous spas and health resorts in Germany are Baden Baden, Wiesbaden, and Bad Homburg, for example. But there are many more. Most health resorts and spas are specialised to treat certain health conditions and illnesses. They have special hospitals (Kurklinik) where people are sent to for rehabilitation after severe illnesses, or to prevend that an illness gets worse. For Germans, the treatment and stay in a Kurklinik is often paid by the public health insurance. However, the spas and health resorts are open to everyone who want to pamper themselves. The range of general wellness treatments is exceptional. Book yourself a nice hotel, a few massages and other treatments, relax, enjoy the German countryside, and return to your everyday life with refreshed batteries. 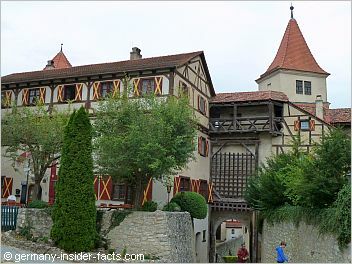 With more than 20,000 German castles and palaces (okay, ruins are included in this number), it is no surprise that you will come across many hotels in Germany which are located in beautiful old castles and palaces. Have you ever dreamt about living like a queen or king? Want to follow the knight behind the dark walls of his medieval castle? In German castle hotels your dream can come true, at least for a night, or two. Do you remember the youth hostels of your childhood? Huge spartan rooms with bunk beds and no privacy, bathrooms with cold water, and you had to clean the dishes after a meal? Hmmm, at least hostels were like that in Germany when I was a child. But I loved them, nevertheless. Things are slightly different these days. Of course, you can still get a bed in a bunk room, however, hostels also offer family rooms and double rooms, even with private facilities, for travellers. Hostels offer reasonable, inexpensive accommodation, tips and tours, and it is easy to get in contact with other travellers. 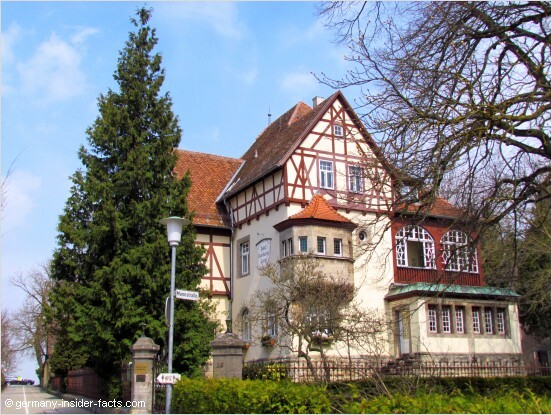 Driving through small towns in holiday regions in Germany, you'll often notice a sign "Zimmer/Ferienwohnung Frei" (rooms/holiday flat vacant) in front of houses. House owners rent a spare room or a holiday flat in their houses to visitors. This type of accommodation is usually not available just for one night. Especially for families renting a holiday flat is a good way to save money. Apart from that, it is much more convenient to have your own self-contained unit with a kitchen to prepare a meal. When you rent a Privatzimmer, breakfast (Frühstück) is usually included, whereas in a Ferienwohnung (holiday flat) you have to prepare breakfast yourself. It is not unusual that Germans return to their favourite holiday flat or bed & breakfast accommodation for many years and become close friends with their hosts. Rent the perfect vacation home at HomeAway.com!! This is a category of accommodation in Germany where I struggle to find the correct translation for the German words, especially since there seems to be a difference between British and American English as well. So let me explain what's behind the German expressions. 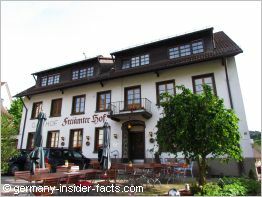 A Gasthof or Gasthaus is a restaurant in small towns and rural areas, often family operated and owned by the family for generations. A Gasthaus/Gasthof can offer accommodation as well, usually with an additional sign saying "Pension", "Zimmer", or even "Hotel". It's in a Gasthof/Gasthaus where you experience true German Gemütlichkeit (cosiness) and Gastfreundlichkeit (hospitality) with an unique personal touch. Rooms might be not as large as in a hotel, but who wants to spent too much time in a bedroom while on holidays anyway? It is much more fun to sit in the Gaststube (restaurant/bar) and make friends with the locals. 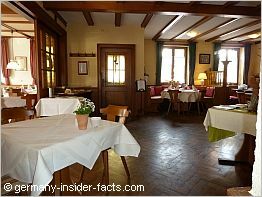 The above pictured Freiämter Hof in the black forest is one of my all-time favourite Gasthaus in Germany. My husband and I have spent many enjoyable short breaks there, and our friends from abroad just loved it. Zimmer mit Frühstück - room and breakfast. Breakfast can be buffet style or just bread rolls, butter, jam and some meat or cheese. Coffee or tea is included. Halbpension - half board - a room with breakfast and one other meal included in the price, usually dinner. Vollpension - room with breakfast, lunch and dinner. Apart from coffee / tea for breakfast, you have to pay for your drinks. Haben sie ein Zimmer für eine Nacht / zwei Nächte? - Do you have a room for one night / two nights? Ist Frühstück im Preis eingeschlossen? - Is breakfast included in the room rate? Hat das Zimmer Dusche/WC? - Does the room come with shower / toilet? Wann gibt es Frühstück? - What time is breakfast? Reading hotel reviews on other websites I noticed that the facts a few travellers complained about are quite normal features in German hotels. Know the difference to what you are used to and avoid disappointment. Except for the big hotel chains, this is true. Sure, it can get hot in Germany for a few days in summer, but long heat waves are not the norm here. However, you can take it for granted that all these hotel rooms have central heating for a cosy stay in winter. The size of rooms varies a lot. Standard rooms are usually smaller than "comfort", "luxury", "superior" or whatever the more expensive rooms are called. Single rooms can be very small. Modern hotels on the edge of a city are probably more comfortable, but then, I would always prefer a small room in an charming old hotel right in the city centre. The beautiful half-timbered houses in small towns have a lot of atmosphere. The only disadvantage is that they can have up to five floors with no lift available. If you can't stand the smell of smoke you should always ask for a non-smoking room. Although non-smoking hotels are the majority these days, there are still some places that allow smoking in the room. Some hotels offer a "smoking section" or have a balcony where smoking is allowed. Disclosure: germany-insider-facts.com is not a travel agency. I do research to find hotels with great reviews and recommend my favourites. So, some links on this page are affiliate links. This means when you book a hotel through one of these links, I earn a small commission (there is no extra cost for you). This money helps me to maintain this website and provide the free information. When you are interested in a hotel, you make the booking on the provider's website. Be sure to read all details before you book. Thank you for supporting this website.